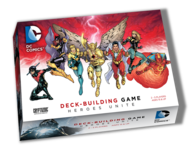 In the DC Comics Deck-building Game: Heroes Unite, each player takes on the role of a Super Hero such as Shazam! or Hawkman. Your Super Hero has an ability that will guide your strategy throughout the game. Each player starts with his own basic 10-card deck and draws a hand of 5 cards each turn. Power is the currency you will use to buy new, stronger cards to add to your deck. A large, central stack of cards supplies a five-card “Line-Up” from which players make their purchases. Each player will always have five face-up cards to choose from each turn, so every turn there are new options and surprises. When a player has amassed enough Power, he or she may defeat the current Super-Villain. When a Super-Villain is defeated, a new one appears and makes an Attack against each player in the game! Players can defend themselves with Defense cards like Force Field, the Helmet of Fate, or several others. In the end, the player who has accumulated the most Victory Points from the cards in his or her deck wins the game. This is the follow-up to the 2012 hit DC Comics Deck-building Game. Play Heroes United on its own, or combine it with the original for an epic battle!